Crochet came from the word croc, which is French for hook. Crocheting is an art of fabric creation from a thread, cord or other materials using a crochet hook. Some say that the craft of crocheting originated from parts of South America, Arabia and China. However, there has been no true evidence of this claim. It eventually became popular in the 1800s in Europe. Some say that the process used in crocheting was present during ancient times but the hook itself which is used in crocheting was not yet in existence. People back then used their ﬁngers which were bent to be able to make loops and chains. Crocheting, as we know it today, began to be seen during the mid 1700s. This was the time when tambour embroidery reached Europe. Tambour embroidery was done using a smaller crochet-like hook. The earliest evidence of crocheting dates to around 1800. (Samples should have been present in archaeological ﬁnds if crochet existed before the 1700s.) Some claim that crochet pieces can be found in Egyptian tombs and some say that there were crochet works which were made by nuns to beautify early churches. It has been argued that crocheting is a very simple technique and it most probably had its beginnings during ancient times. But no pieces have been found to legitimize these claims. In the 1800s, crocheting became a lace substitute. Laces were very expensive, and people turned to crocheting to be able to produce less expensive fabrics. Crocheting doesn’t need much equipment and most people can do it. People started to crochet natural ﬁbers and used hooks which were made of brass, ivory and hardwood. As time went on, crocheting became more and more popular, ﬁnding its niche as a cottage industry. The craft supported some communities when their livelihoods were displaced. The items were purchased by the middle class, or those who were emerging in society. Fabrics which were made out of crochet were seen as a mere imitation of the symbol of richer families. The people who were able to aﬀord the more expensive fabrics which were made from more expensive methods hated crochet. Queen Victoria somewhat mitigated the bad reputation of crochet. She purchased crochet laces which were produced by the Irish and learned crocheting herself. Crocheting was done mostly with thread from 1800 to 1950s. 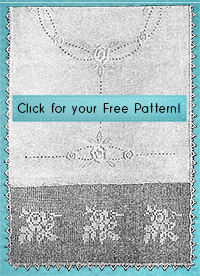 The most common kinds of crochet methods were ﬁlet crochet and crochet in the round. They were worked in rows of closed or open mesh to build patterns. Steel hooks were mass produced and were popular beginning in 1900. In the 1950s, crocheters were already using thick yarns to be able to create less detailed clothing and afghans. During the 1960s, more and more people got hooked on crocheting, especially the younger generations. Popular patterns began to emerge, such as granny squares and ponchos. These incorporated bright and fun colors. The interest of the younger generation in the 1960s gave crocheting a boost in popularity. Breaking it down to basics, crocheting is done by pulling loops of thread or yarn through previously made loops with a hook, to create a fabric. Taller stitches are built by wrapping the yarn around the hook—each wrap makes a faux loop—and then pulling the yarn through one wrap at a time. Crocheting is diﬀerent than other kinds of fabric-making methods. Crochet is fairly young, compared to other fabric-making techniques. It has gone through several evolutionary steps to become the art which we know today.